My Los Angeles mission was not quite complete with last weekend’s concerts. 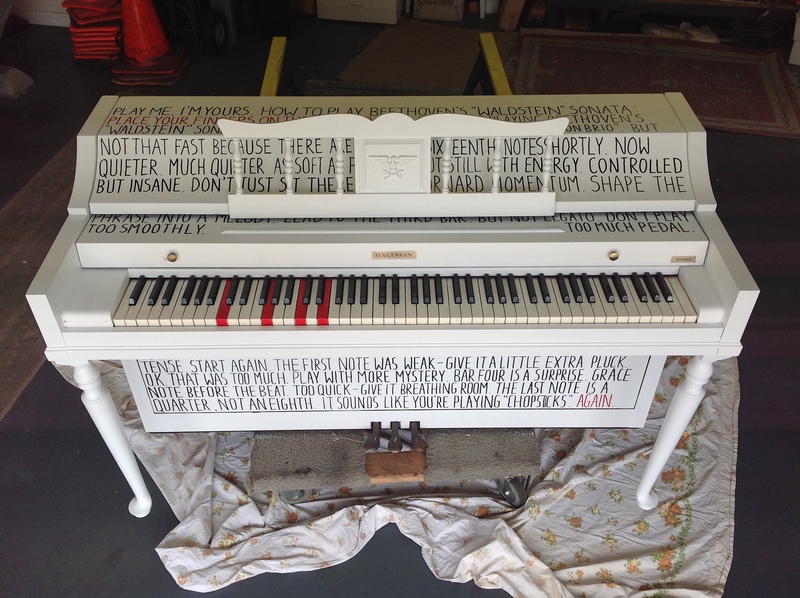 The past couple of days were spent leisurely deco­rat­ing a piano for the public art project Play Me I’m Yours, which New Yorkers might remember from this past summer. The idea is that a whole fleet of pianos are placed at various public junc­tures through­out a city, each having been deco­rated in some more-or-less haphaz­ard way, and any passersby can sit down and play. I’m not much of a repre­sen­ta­tional painter so I decided to make my piano into a more ‘concep­tual piece’ (I can’t believe I’m saying this) titled How to play Beethoven’s ‘Wald­stein’ Sonata. The piano is covered with a litany of instruc­tional comments sugges­tive of a partic­u­larly sadistic piano teacher. Most of the pianos I saw in New York were done up in a more feel-good manner (in the spirit of the overall “Play me, I’m yours” mental­ity) so I thought it would be funny to contribute some­thing slightly off-putting, almost daring you to play. Here are some photos (click to zoom in). 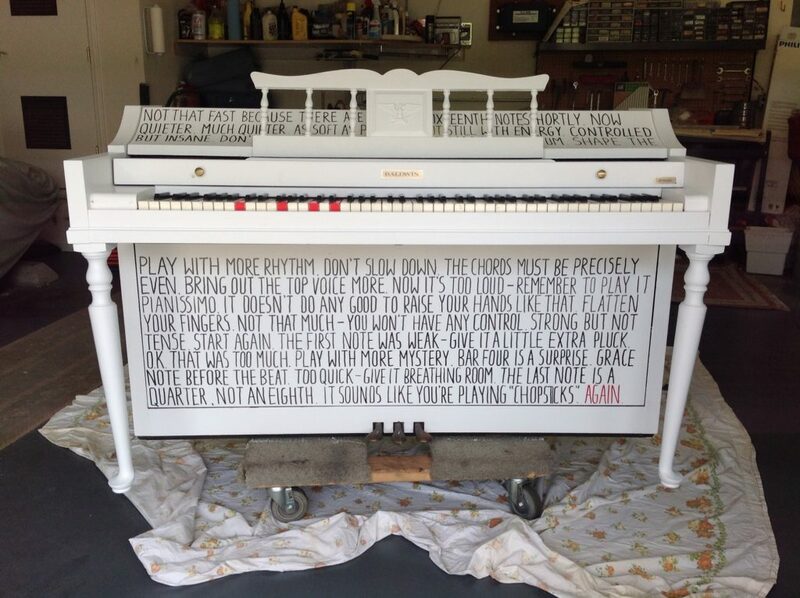 You’ll be able to see the finished piano in person starting April 12, in front of Rhino Records in Clare­mont, 235 Yale Ave. no less. Wow: I am having flash­backs to piano lessons from my youth when I was hammer­ing away at a measly minuet. I wish you could cart the White Rhino back to New York City. 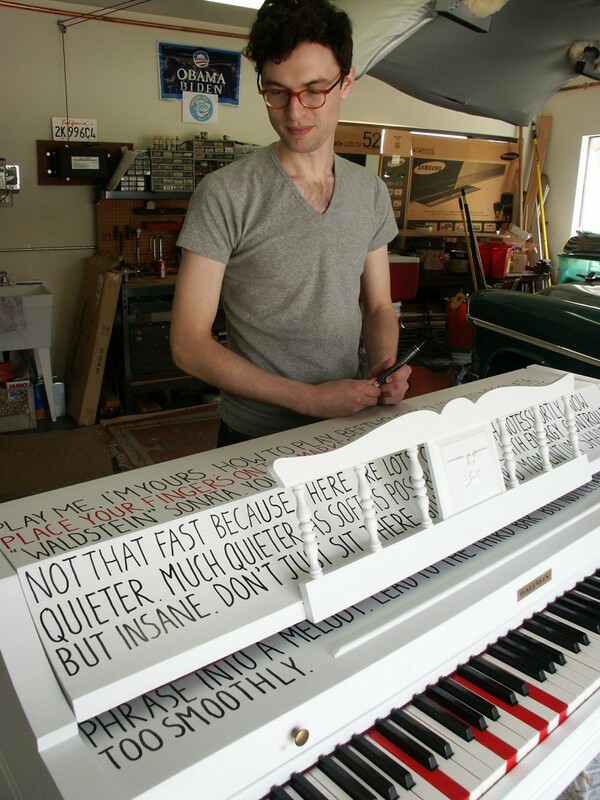 Composer, Pianist, Graphic Designer, Piano Painter…the list goes on. I hope you can reprise The White Rhino if “Play Me, I’m Yours” returns to NYC. Have a great time in L.A. Thanks, Lars! I didn’t mean to stir up bad memories!